‘Tis a humid sea air.. that veils our calm city by the sea, creating its own environment-friendly footprint!! There are no doubts about the current Dialog knockouts or the quality finishing on fire. Havelocks must be rubbing their hands and licking their lips in growing anticipation. What a grand season indeed for the pink and chocolate gladiators. Impossible to imagine the purpose and focus of the boys in Havies 1st squad pre-season...? Coach Martis and Lakala Perera accepting their tasks with an of trepidation? Essentially all their Sri rep players had sought greener pastures. Capt. Niroshan Fernando is unable to comprehend the thinking and loyalty to your clubmates etc. To decipher that would probably be compatible with understanding the Bermuda triangle, available on Google maps? Credit to the coaching staff and management for encouraging effort and purpose. Take the claptrap of the screen, no more shining apps to push for good habits and bigger gains. As a unit with realistic achievements. Many experts and highly decorated pundits hopped on the bandwagon, wrote Havies off and were waxing lyrical on how CR or NAVY.. might have the goods? M.lOr can a new blood CH, packing plenty of rep names, really threaten Kandy’s superior consistency and remarkable track record. Kandy have been league champions back to back for the 5 Dialog seasons. Their team composition and bench strength are almost magical. Essentially a team that can adrenalin boost pace and experience... every time they recycle. For opposing teams, a quick grab of the Kandy bench depth and strength is formidable. 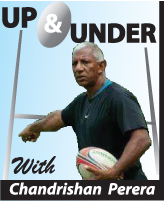 Like I tapped the stat facts out last week.. not many clubs have the luxury of such depth and impact.... for a simple rewind... consider Shehan ‘ Lemma, Soyuru Anthony, Perera twins, Wilivera Udangamuwa, Ratwatte, Sooriyabandara.... quite demoralizing for teams to see them stretch and mind warm up. Lights on the Weeraratne brothers whose contribution to the school, and country, is phenomenal. It’s pretty much a dream. After all that we heard that Kandy is not comfortable playing at a neutral venue... sighting home advantage for CH ?? Playing at Racecourse. The purpose-built multimillion $ rugby facility is 2nd to none and much pride for Sri Lanka rugby. Equally mighty keen to cement our ranking as the top 3 rugby nation in the new Asian elite premiership. It’s almost the end of March 2019 and the appetite for pure skills, hazy sun and max performance is difficult to fathom.... but its growing daily. Wales won the grand slam by simply sticking to what they know best... they put max pressure and deliberately wore Ireland down, despite starting as firm favourites Hard cheese to lose their opener at Twickenham to an invigorated England... Owen Farrell not under pressure at all, and setting his boiler house boys with Vunipola. Itoje, Daly, Slade grinding Ireland. They made Sexton make mistakes with huge pressure.. Tuillangi Teo Youngs and Farrell very calm and in the zone...stifled Ireland breathing on the deck, and almost tackled them at pace. Eddie Jones is a master craftsman and needs all his experience, Intel..and rugby instincts to propel England to believe in themselves in Japan this September. Warren Gatland grabbed another 6 Nations Grand Slam title... for captain Jones. Hadleigh, Moriarty and the likes of George North and Anscombe.. gave Wales the perfect nudge before the RWC 2019 in Japan. At home, the Singer schools league is two weeks old and very much true to form..as experience and discipline start to assert themselves. Royal, Joseph’s, Isipatana, Peter’s, Kingswood, Trinity, Science, Wesley, Zahira, St Anthony’s and Maliyadeva. With the exception of S. Thomas surprising Peter’s in their opening game ..all shipshape and according to the traditional Singers school rugby script. Let’s assume that all the logistics are well set with the school association’s able to central control and police the season effectively. There has been much speculation and too much interpretation of designated responsibility on and off the pitch. Anticipating a cracking season for the schools league championship... no love lost and absolute pride and reputation on the line every single kick off. Ideally, Havelocks play Airforce for the Dialog Clifford Cup and more knockout drama right down to the wire and nowhere to hide. Island rugby hearts in the zone stay strong and breathe with a defined purpose.. it is all or a nothing now.. and everything to play for.